I was once again heading to San Diego to meet up with the wife for the Memorial Day weekend, stopping at UCSB to pick up our daughter to join us. I would get to UCSB in the afternoon after she was finished with classes, but in the meantime I had planned some hikes in the Los Padres NF. I'd spent the night at the Colson Canyon Campground off Tepusquet Rd, a primitive and rather crappy campground, even by the low USFS standards. The place was overgrown and neglected, like much of this part of the forest. Not surprisingly, I had the place to myself on a Thursday evening, and I had a very quiet and enjoyable rest there that night. I was up the next morning, seeking out a few summits in the area. This near-P1K is located less than a mile NE of the campground. There is an active quarry located on the peak's SSE Ridge. The quarry road is gated at the bottom where the forest road goes over a saddle between Colson and Rattlesnake Canyons. The forest road was also gated at the saddle, so this was as far as I could drive into the forest. The quarry road has no signs, but there was also no opening for foot traffic, making public use of the road uncertain. A white truck drove up it just before I started out, so I knew the quarry was still active. After squeezing through the gate, I hiked up the road, figuring I had plausible deniability. The skies were heavily overcast and it seemed I might be hiking up into clouds for a second day. At least the weather was nicely conducive for hiking. Less than a mile up the road, before reaching the quarry, a junction is found with an unused road to the left. There is some nice stonework here, indicating more love at some point in the past. This old road leads nicely towards the summit, though the tall grasses were wet with dew and I would find my boots and pants fairly soaked before I was done. I spent about 40min covering the mile and a half distance to the summit, the last quarter mile easy cross-country where the road bypasses the summit on the west side. I found no views, no obvious highpoint, no register, no love. On a clearer day, there would be good views to the east into Bear Canyon and southwest to Tepusquet Peak. After returning to the car where I'd left it at the saddle, a large petroleum truck came rumbling up the road to service the quarry. Seems this place is pretty busy. Fail - These were the summits I was really after, particularly the P1K which is the most prominent summit in the Sierra Madre Mtns. There are telecom towers on both summits with decent roads reaching to the twin summits from Ruiz Canyon off Tepusquet Rd. I have been eyeing them for a number of years now. Though heavily signed for Private Property and No Trepassing, I had driven up Ruiz Canyon the night before to check it out. Signs continuously warn of locked gates and no turnarounds, but this doesn't seem to be the case. Gates were open and I noted several possible turnaround areas. Something called "The Fort" is signed for regularly, with private spur roads going to homestead along the canyon on the left. The Fort turns out to be an eclectic collection of Old West-type buildings that were the long-term project of Elwin Mussell who started it in the 1950s and worked on it up until his death in 1980. The Knight family currently maintains it, all of this information gleaned from the Internet later, not through my visit. I decided I had pressed my luck on the road and turned around before reaching the first major switchback, near where The Fort is located. Maybe someone with more chutzpah than I can drive up and see if this is a viable way to reach the summit. I still had lots of time before I was due at UCSB, so I drove north to the Rock Front OHV area to pay a visit to the highpoint of the Los Machos Hills, a sub-range within the Los Padres NF. I had been here on two previous occasions, most recently in November. The Jeep made exploring this area far easier, and great fun, too. I followed a series of roads into the OHV, eventually finding my way past the Paradise Campground and onto a ridge running north to the Los Machos Hills. Here I was confronted with a sign saying the road ended in a mile, which it did, at a private property boundary. This contrasts sharply with the OHV map found on the USFS website which clearly shows a 4WD road reaching to Los Machos Hills. The map must more than a decade out of date because it has been at least that long since the public has been granted access to that part of the forest. The road continues through a corner of private property before re-entering the national forest where one can then legally hike to Los Machos Hills HP. Judging from the lightly used tread on the road within the private property, I didn't expect to see anyone up this way during my short visit, so I simply parked the Jeep and went in on foot. It's about 2mi each way to the highpoint, taking about 50min along various roads in various stages of being reclaimed by nature. It's a very scenic area with wonderful grass and oak woodlands mixed with chaparral along the ridgetops. The first 1/3mi goes through the private property to a second gate, the other side of which is the forest lands, unused for quite some time now, but still serviceable as a hiking route. I made my way down to a low saddle before hiking back up along the old roadbed. The last parts are just a narrow cut in the chapparal, used by motorcycles back in the day. It would take a good deal of work to clear out the brush to make it useable again. I found the summit with limited views because of the high brush on all sides. I picked out what looked like the highest rocks to call the summit and left a register there, before returning. I spent the next two and half hours driving myself back out to SR166 and then south to Goleta to pick up my daughter for a short afternoon hike. It seems it was happy hour at UCSB - students were 2-for-1 all afternoon. Jackie and her friend Kelly piled into the Jeep with me and we drove up into the Santa Ynez Mtns above Goleta. 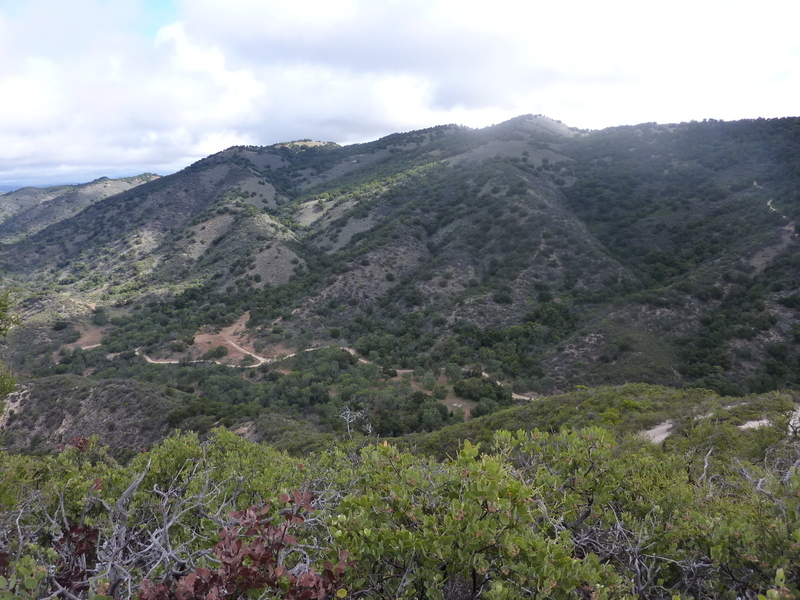 My goal was a modest hike to Condor Point, about a mile and a third from West Camino Cielo Rd, the main access road that runs along the crest of the range. The road had only recently reopened after the Thomas Fire had burned over much of the range the previous Fall. Though not suitable for low-clearance, any high-clearance vehicle can navigate the sometimes rough West Camino Cielo Rd after the pavement ends west of the gun club. We spent about an hour driving to our starting point on the crest. Condor Point juts off the main ridgeline to the south, conveniently serviced by an old firebreak that can be used by hikers and cyclists to access Condor Point. As we hiked along, I was amused to listen to Kelly and Jackie discussing gravitational lensing (an effect of space-time warping), among a host of other topics, while I followed behind. Their chatter was pretty much non-stop, in sharp contrast to my solo hiking the past few days. It wasn't unwelcome, mind you, actually entertaining. Strong winds in the afternoon that made for unusually clear skies, with the Channel Islands visible in great detail off the coast to the south. Much of the landscape we hiked through had burned in the fire, but it was already recovering with new green and plenty of wildflowers to add color. After spending about an hour on the roundtrip hike, we continued west in the Jeep to pay a visit to Broadcast Peak, a tower-topped summit I had missed on a previous visit. The highpoint is actually a small boulder inside the perimeter fence, easily breached. Jackie took the opportunity to climb a ladder to the roof of one of the buildings before we called it a day. After this quick visit, we got back in the Jeep to drive back down to Goleta, utilizing paved (but winding) Refugio Rd. Back in Goleta we got poke for dinner before I dropped the two of them back off at their dorm. I went off to find a place to spend the night with plans to come back and get Jackie in the morning to continue our way south to San Diego. Hi, I have lived in SB for 26 years and enjoy reading your exploits. I'm a peakbagger, too, but not quite at your level! When I climbed Tepusquet Peak one October, I walked up the road a short distance and then went steeply south up to the ridge, and followed the ridge without incident up to the peak and back. A fine hike I need to repeat. I also have been up Manzanita Peak east of LaBrea Creek there, but that was when you could drive down from the saddle. I road my mountain bike down it a few months ago and the road was quite good to the creek bed. South it got into really soft sand with cow tracks everywhere, and north it was obliterated by floods so as to be not even visible. Shame, as it is some nice country!